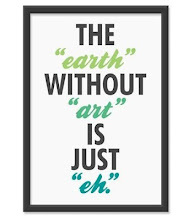 The community outreach program sponsored by the Rio Rancho Art Association called, "Paint With An Artist" at the Esther Bone Library on April 28, 2012 is now full and so is the waiting list! Rio Rancho Art Association will be doing another "Paint With An Artist" program at Esther Bone Library in October, so be sure to keep track of when that is posted and sign up early for it (as you can see, it fills up quickly). 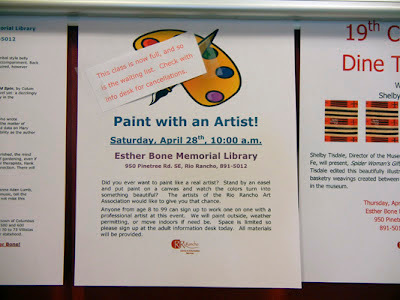 This is not the first time Rio Rancho Art Association (RRAA) has done a "Paint With An Artist" event at the Esther Bone Library. There was one done back in Feb. 2009 where a live Anime model was used. In October, 2008, an plein air "Paint With An Artist" event was hosted by RRAA which also proved to be a big hit. You can view some of the images taken of this event at RRAA's Flickr Photostream. Is this all going to be explained at the next meeting. I volunteered but not sure for what. If it is a bunch of kids it ought to be fun.